This year has already demonstrated why activists continue to decry an ‘epidemic’ of fatal violence directed at transgender women. Transgender advocates have, for years, been calling for an end to what they label the “epidemic” of transphobic violence. And while every November 20, the community and its allies remember those lives lost on the international Transgender Day of Remembrance, 2015 has been a particularly deadly year for transgender women in the United States. In the first seven weeks of the year, seven trans women were killed in the U.S.
At press time, 11 transgender women have been murdered this year alone — with one additional victim whose gender identity has been disputed in press reports and among family members and activists. By comparison, 12 transgender women were killed in the U.S. in all of 2014, though neither of these totals account for individuals whose deaths were not reported or investigated, nor for victims who were misgendered or not regarded as trans women in death. 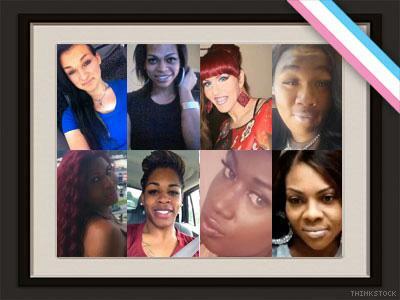 Read on to learn more about the women whose lives were taken due to transphobic bias and senseless, fatal violence. K.c. Haggard, a 66-year-old transgender woman, was fatally stabbed in the early morning hours of July 23. The former security guard was walking down the streets of Fresno, Calif., just before 2 a.m., when a light-colored Saturn SUV pulled up to the curb, and a passenger called to her. According to graphic video of the attack captured by a tattoo shop across the street, the passenger in the car speaks to Haggard for less than one minute before striking with a knife, slashing the woman’s throat. The car then sped away, as Haggard reportedly remained bleeding on the street for 20 minutes before a passerby called paramedics. She was pronounced dead at the hospital. While little is known about Haggard at this point, both of her two Facebook profiles (the second opened after she stopped posting to the first) indicates that she was retired and a graduate of Chapman University. The more recently updated profile — which was kept under her male birth name and pronouns — also includes a four-month-old post in which Haggard refers to herself as “K.c.” In it, she gives Rep’s Sports Bar, located on Blackstone Avenue, the same street on which she died, a five-star review. Haggard asks in the post for her friends — “all TG [transgender] girls” — to come “hangout.” She had three other Facebook profiles under “K.c. Haggard” that used female pronouns. 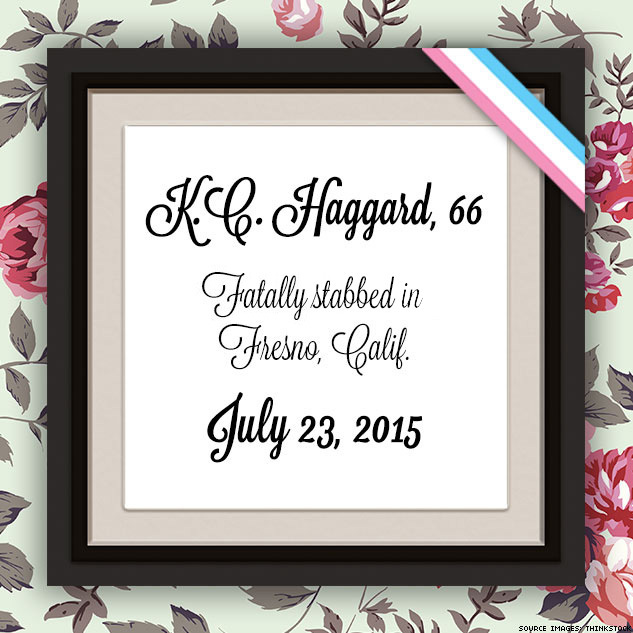 Police are investigating Haggard’s death as a homicide, but local trans advocates say it was a hate crime. Karen Adell Scot, executive director of TransCare, told local TV station KSFN she believes the killing was hate-motivated because it did not appear to be an attempted robbery. “”There was no purse taken, they didn’t even try to take it,” Scot explained. Anyone with information surrounding the attack is asked to contact Fresno Police homicide detective Alfonso Castillo at (559) 621-2449 or Leonard Cabrera at (559) 621-2451. Anonymous tips can also be given to Crime Stoppers at (559) 498-STOP. 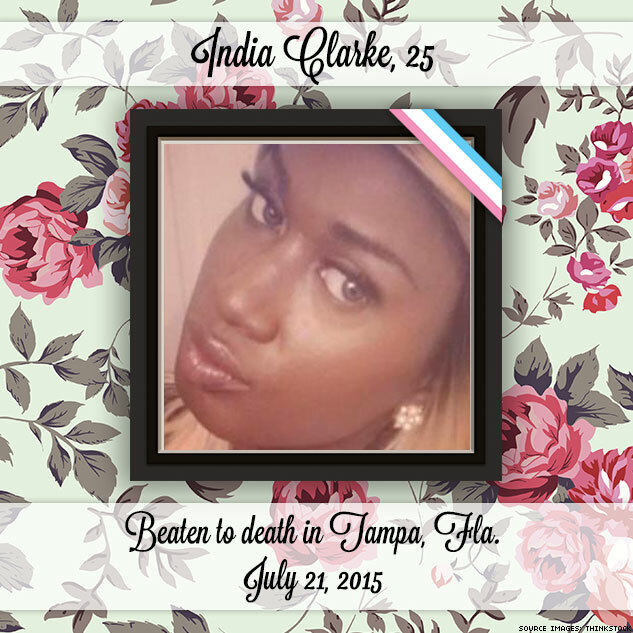 India Clarke, a 25-year-old black transgender woman, was found beaten to death on July 21, outside Tampa, Florida’s University Area Community Center. A park employee called police after discovering Clarke’s body just before 9 a.m. near the basketball courts. She died from blunt force trauma to the upper body. Family told the local media they had last seen her just two days earlier, spending time with her nephews. The young woman’s mother, Thelma Clarke, fondly remembered her daughter to Tampa Bay TV station WTSP as “a good-hearted person, a very loving person” who enjoyed laughing and making others smile. She was studying to be a cosmetologist. “[Her] last words when [she] headed out the door were, “Mom, I love you, Dad, I love you. And we both said, ‘We love you too,” Thelma Clarke recalled. As is sadly often the case, local media have gone against journalistic best standards in covering Clarke’s death, using her birth name and male pronouns, referring to her as a “man in a dress,” and bringing up prior arrests that did not lead to convictions in their reports. The Hillsborough County Sheriff’s Office indicated that they would be tracing Clarke’s previous alleged criminal activity to see if it is related to her death. Sheriff’s deputies are currently searching for leads, and local commmunity organization Crime Stoppers is offering up to $3,000 for information that leads to the arrest of a suspect or suspects. Officials have not indicated whether Clarke’s murder will be considered a hate crime, but the victim’s father, Samuel L. Clarke, told Tampa Bay’s BHTV that his family has considered it might be and hopes it was was not. Anyone with information related to case is asked to contact Crime Stoppers at 1-800-873-TIPS (8477), report a tip anonymously online at this website, or send a mobile tip using the TipSubmit Mobile application. They are also asked to call the Hillsborough County Sheriff’s Office at 813-247-8200. 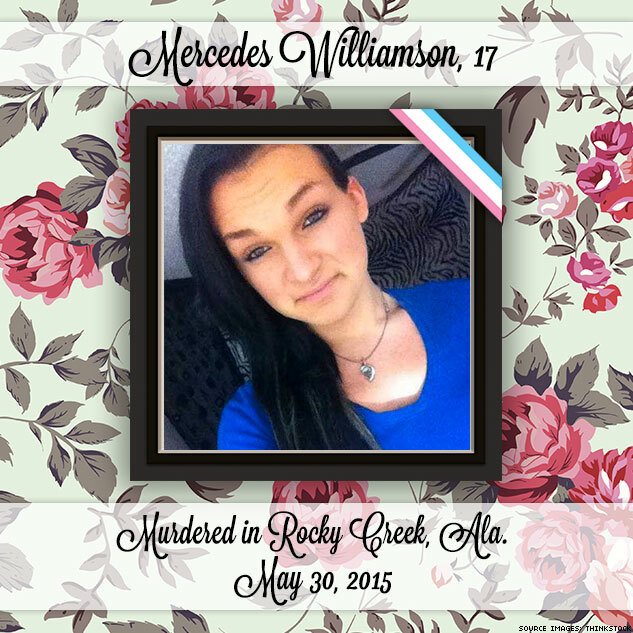 Mercedes Williamson went missing May 30 and was found two days later buried in a field behind her murderer’s father’s house. In early June, police from George County, Mississippi, unearthed the 17-year-old’s body, buried on May 30 in Rocky Creek, Alabama, after she was reportedly stabbed to death. A day after the murder, 28-year-old Josh Brandon Vallum told his father, Bobby Vallum, that he had killed a person and buried their body in the wooded field behind his father’s Rocky Creek home, according to police records. Bobby Vallum reported the confession to police, who found a partially decomposed body hidden under debris on the property at 9 a.m. on June 2. Mississippi’s Sun Herald newspaper reports that Josh Vallum is a longtime member of the Latin Kings street gang. He has been charged with murder and is being held at George County jail on $1 million bond. Hate-crime charges have not been filed in the case, and police have not revealed a motive. It remains unclear whether Williamson’s murder was related to Vallum’s gang activity. Williamson was misgendered by local Alabama media until the Sun Herald, a Mississippi newspaper, sent reporters to the neighboring state to learn more about her life as a transgender woman. The Herald found that Williamson, an aspiring cosmetologist who enjoyed spending time outdoors, appeared to be estranged from her Mississippi birth family, as she had moved alone from Alabama’s Gulf Shores to the town of Theodore, to live in a trailer with 41-year-old friend Jeanie Miller. Williamson had been sleeping on the couch in the one-bedroom trailer’s front room since September. Miller told the Herald she last saw the trans teen, who Miller said she loved like a “daughter,” when she left their trailer around 2 p.m. the day she was murdered, saying she was going to spend time at “the bay” in Gulf Shores. Williamson was supposed to be picked up by a friend, but a witness said she departed in an unknown silver vehicle. After Williamson did not return home for several days, Miller says she called the friend who she thought had picked Williamson up. The girl informed her Williamson was dead. 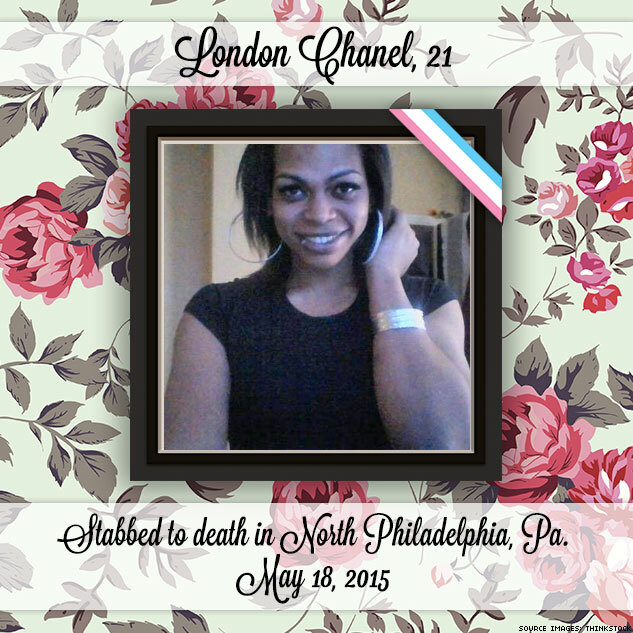 London Chanel, a 21-year-old black trans woman, was found shortly after midnight May 18 in front of an abandoned North Philadelphia house, deceased from two stab wounds to her back and one to the neck, reports Philadelphia NBC affiliate WCAU. The fatal altercation began with a verbal fight between Chanel and a 31-year-old man inside the house, according to a witness statement to police. After stabbing Chanel, the man, whose name has not been released, and the witness reportedly carried Chanel’s body outside the house, placed her on quilts, and began attempting to perform CPR. When the pair saw a School District of Philadelphia officer, they flagged him down, and he called Philadelphia police. Rushed to a hospital, Chanel was declared dead on arrival. Both the assailant and the witness were taken into custody but do not currently face charges, according to WCAU. The alleged assailant had a pocketknife, believed to be the murder weapon, on him when he was apprehended. Chanel, like many trans female victims of violence, was originally identified as a “man” in police reports, and accordingly reported by the local news station as such. Nellie Fitzpatrick, the director of the Mayor’s Office of LGBT Affairs for the City of Philadelphia, told BuzzFeed News that she heard an “immediate outcry” from community members over the misgendering. She called the local station, which apologized for the error and updated its story to indicate that Chanel was a woman. Allen is currently raising funds to pay for flying her daughter’s body back to her Texas hometown for burial. After initially ruling her death a suicide, Miami police concluded that the death of 46-year-old Latina trans woman Kristina Gomez Reinwald on February 16 was a homicide. 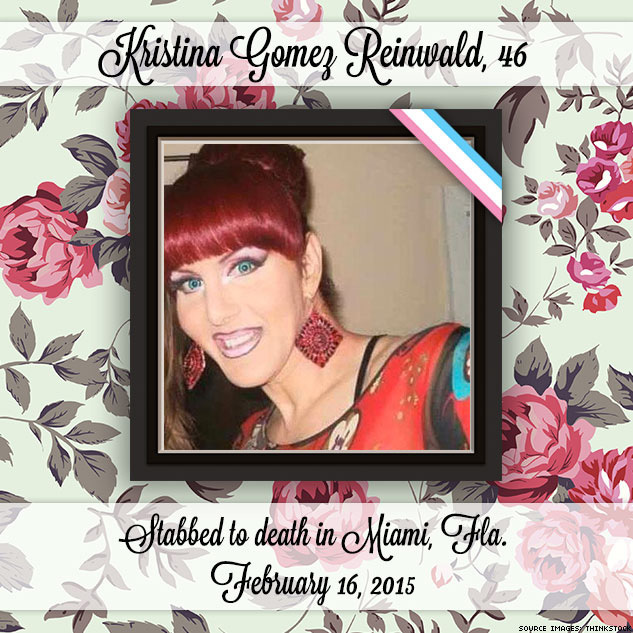 Reports of Reinwald being killed by an assailant first began circulating on social media among trans advocates shortly after her death, using a hashtag of a second name she was known by in her work as an entertainer — Christina (or Kristina) Grant Infiniti — days before police officially concluded she’d been murdered. Friends of the victim claim she was stabbed to death by her boyfriend (who was possibly her ex-boyfriend), but police are still investigating multiple leads, according to the Miami New Times. Officials noted that there were no signs of forced entry in Reinwald’s home, suggesting that she knew her killer, reports Miami station WPLG. Anyone with information about Kristina Gomez Reinwald’s death is asked to call Miami-Dade Crime Stoppers at 305-471-TIPS. Penny Proud was a 21-year-old black trans woman living in New Orleans, and an active part of the city’s LGBT youth community. She was fatally shot multiple times at 1:30 a.m. on February 10 in what police say was a robbery. Her death sent shockwaves through her local trans community and through others nationwide, as her case became the fifth reported murder of a transgender woman of color within the first five weeks of 2015. The tragedy also elevated a conversation about how to respectfully refer to trans victims of violence that has increasingly gained a wider audience. Initial local reports misgendered Proud, not referring to her with her true name and pronouns. New Orleans LGBT youth of color activist group BreakOUT! took a lead in calling on New Orleans news site NOLA and others to adhere to respectful journalistic standards when reporting on trans people. Nevertheless, NOLA has defended its practices and continued to misgender proud, according to Media Matters. In May, BreakOUT! took the conversation into its own hands, erecting a can’t-miss-it billboardover the Broad St. Bridge in New Orleans. Spanning more than 24 feet across, the billboard displays an illustration of a smiling Proud, accompanied by popular social media hashtags “#BlackTransLivesMatter” and “#MakePennyProud.” The enormous sign was seen by 400,000 commuters and passers-by each day, organizers estimate. It stayed up for two months, sparking conversation throughout the city. But perhaps the most affirming response of all comes from Proud’s grandmother, Ms. Nadine — who told BreakOUT! that she’d received calls from several family members about the billboard. 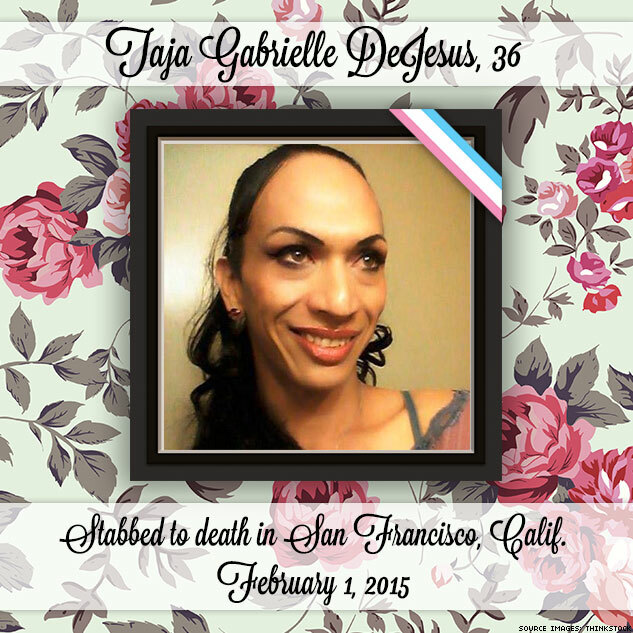 Taja Gabrielle DeJesus, a 36-year-old trans woman of color, was found fatally stabbed multiple times in a stairwell the morning of February 1 in San Francisco’s Bayview District. Five days after officials discovered the Latina woman’s body, police told the San Francisco Weekly they had found her suspected assailant, 49-year-old James Hayes, dead in an apparent suicide. His body was discovered behind a warehouse a half mile from where DeJesus’s body was found. In the San Francisco Chronicle, DeJesus’s mother, Pamela DeJesus of San Jose, remembered her as “beautiful inside and out,” often giving away anything “extra” she had to those who needed it. DeJesus recounted how spirited and independent her daughter Taja was, having gotten her first job at age 15, raising enough money to buy a stereo to play the music she was passionate about, and traveling often to San Francisco until she was able to permanently move to Bayview, where she felt her identity was more tolerated than in her hometown. Anyone with information about DeJesus’s murder is asked to contact the San Francisco Police Department at (415) 575-4444. 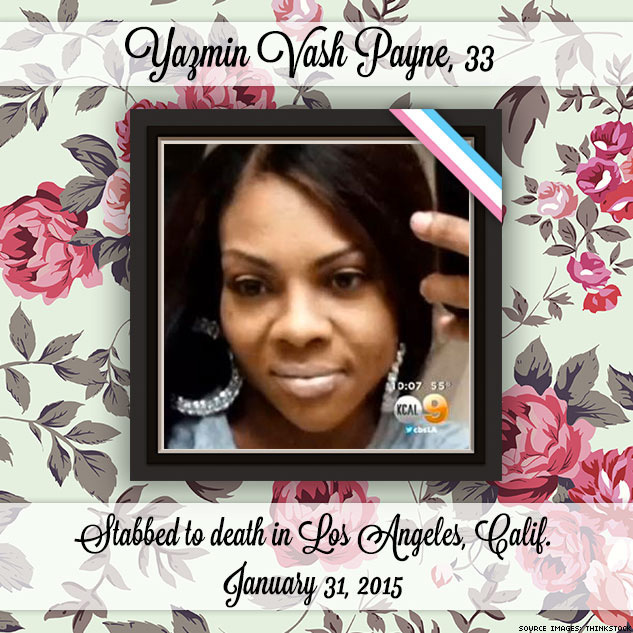 Yazmin Vash Payne was 33 years old was found shortly after 5 a.m. on January 31 in her apartment’s kitchen, dead of multiple stab wounds, as firefighters were responding to reports of a fire in a rear bedroom. Police say neighbors heard Payne arguing late into the night with her boyfriend, with whom she had recently moved into the building, and the fire started soon afterward. Three days later, that boyfriend Ezekiel Dear, 25, confessed to murdering Payne, turning himself into police, accompanied by a pastor as he walked into the 77th Police Precinct. Protestors gathered to mourn Payne’s death denounced the ongoing crisis at a candlelight vigil and march held February 1 outside Payne’s apartment building. Her death also marked the third reported murder of a trans woman of color in Los Angeles within four months. 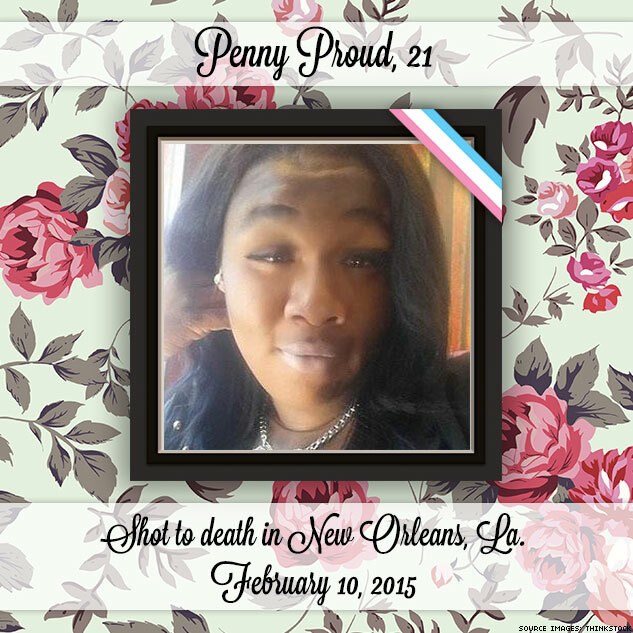 Deshawnda Sanchez, 21, died of a gunshot wound December 3, 2014, and 47-year-old Aniya Parker was fatally shot October 2, 2014, both in suspected robberies. 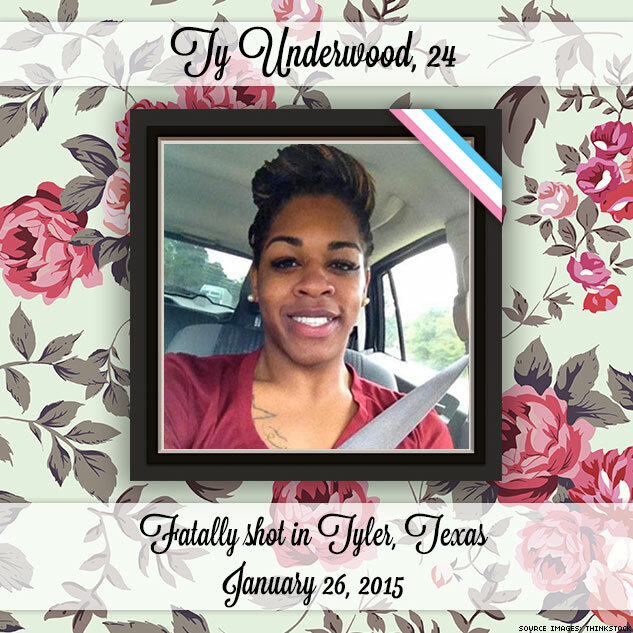 Ty Underwood, a 24-year-old transgender woman of color, was fatally shot in the early morning hours of January 26 in North Tyler, Texas. Police found Underwood when responding to a 911 call from a woman who said her children had heard gunshots and that a car had run into a telephone pole nearby. Detective Andy Erbaugh told reporters he believes that Underwood was near or inside the car when shots were fired at it; Underwood was likely struck while she was trying to drive away. Carlton Ray Champion, Jr., 21, was charged with murder on February 9, after electronic and video evidence revealed that he was meeting Underwood for a date at the time she was killed. Police say that Champion, a student at Texas College, and Underwood, a nursing assistant planning to attend Kilgore College’s nursing program, had been in a “brief relationship” prior to Underwood’s death. Champion was originally detained on January 29 for a probation violation while officials continued to investigate his suspected connection to Underwood’s murder. Champion became a suspect after tips from Underwood’s friends led police to identify him as the man she’d been dating for several weeks prior to her death, notes an affadavit filed in support of an arrest warrant for Champion obtained by local news station KYTX. Police confirmed his and Underwood’s relationship through communications on Champion’s cell phone and tablet that dated back to January 19. While many of Underwood’s friends and supporters say they believe her murder was a hate crime, officials say they are not investigating it as such. Champion is currently being held on $1,000,000 bond. Anyone with information regarding this case is asked to call the Tyler Police Department at (903) 531-1000 or Tyler-Smith County Crime Stoppers at (903) 597-2833. 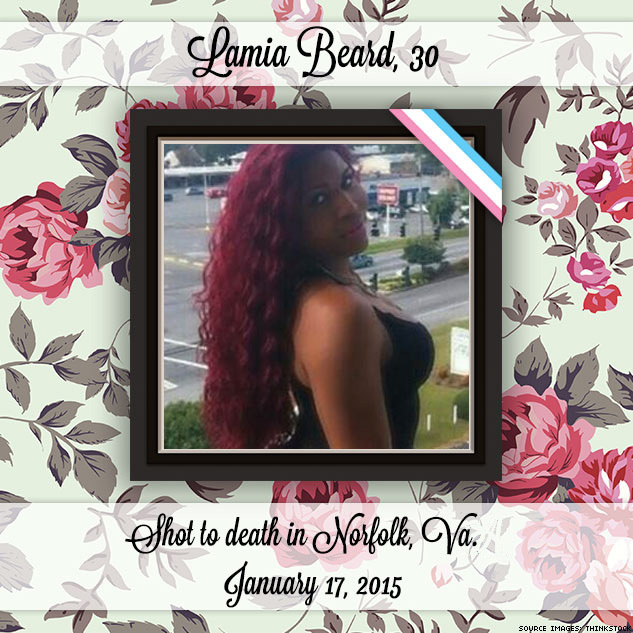 Lamia Beard, a 30-year-old transgender woman of color, died at a hospital after being shot in the early morning hours of January 17. When police in Norfolk, Va., responded to a 911 call at 4 a.m. that day, they found Beard on a sidewalk suffering from a gunshot wound. Beard’s death may be related to a second shooting that occured nearby at 6:30 a.m. in which the victim, identified by officials as male, suffered a nonfatal gunshot wound, reports The Virginian-Pilot, a Norfolk newspaper. Police are still investigating both cases. Area residents held an antiviolence march through Norfolk at noon the day of the shootings, reports local TV station WAVY. Community leaders told reporters the gathering drew attention to systemic social issues, like poverty, of which violence is a “symptom,” and was especially important the weekend before Martin Luther King Jr. Day was celebrated nationwide. “It’s about sending a message to the city that our lives matter,” explained Damien Jenkins, a march organizer. It is unclear whether Beard was recognized as a trans woman during the march. Lamar “Papi” Edwards, 20, was shot to death outside a hotel in Louisville, Ky., on January 9. Two days after Edwards’s death, Louisville Metro Police arrested 20-year-old Henry Richard Gleaves in connection with the crime, and have charged him with murder. At his January 13 arraignment, Gleaves pleaded not guilty. Edwards’s identity remains subject to contradicting reports that alternately identified him as a gay man and as a trans woman. While The Advocate initially reported the crime as a possible anti-transgender homicide, a friend of the victim told this publication that Edwards identified as a gay man and likely participated in drag; the first photo released to media of the victim wearing a women’s wig may have contributed to the belief that he identified as trans. However, BuzzFeed News reporter Dominic Holden launched an in-depth investigation that appears to indicate Edwards did identify as a transgender woman, and was presenting as a woman when they were killed. Although police are not treating the murder as a hate crime, Edwards’s friends stressed to BuzzFeed that their friend was shot to death after the suspect became upset about the fact that Edwards was transgender. 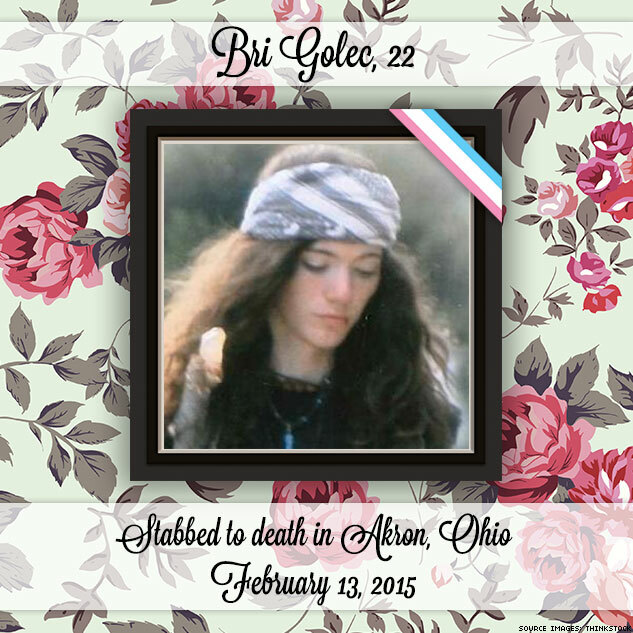 Bri Golec, a 22-year-old living in Akron, Ohio was just beginning to explore a transgender identity when stabbed to death by their father on February 13. Kevin Golec, 52, has been charged with murder and felony domestic violence. Police detained him shortly after 10 p.m. Friday after responding to several calls to 911 he made alleging that several members of a “cult” had broken into his house to commit robbery and had attacked both him and Bri Golec. With no evidence of a robbery, however, police determined that Golec was lying and that it was he who had had an altercation with and fatally stabbed his child. Several advocates believe that Kevin Golec’s statement about a non-existent cult may be a reference to a trans support group Bri Golec had allegedly begun attending again, notes Pennsylvania LGBT blog Pittsburgh Lesbian Correspondent. Reports have conflicted on whether Bri Golec identified as trans, but the Correspondent, the first site to report Golec’s death as the murder of a trans woman, noted that Golec had “recently … began to more assertively explore her gender identity.” Local trans activist Jacob Nash confirmed to the news site that Golec was involved in the local trans community and local group Trans Ohio has sent out a message stating that Golec was a trans woman. Alternately, others who claim to have known the victim have stated on social media that Golec did not identify as trans, notes Gay Star News. Local media, including Cleveland.com, meanwhile identified Golec as male, as has Golec’s public obituary, which advocates decried as misgendering. Read more about these women on The Advocate.